Women Affairs, Community, Small and Medium Enterprises Development Minister Sithembiso Nyoni has embarked on a countrywide tour to assess the extent of damage caused by violent demonstrations last week as part of efforts to come up with a rescue plan. Groups of protesters unleashed violence in Bulawayo and some parts of the country, burning cars, property and looting shops. Minister Nyoni met retailers and reiterated Government's commitment to support business people who lost their goods to the looters. During the meeting that was also attended by Bulawayo Provincial Affairs Minister Judith Ncube, Industry and Commerce Deputy Minister Raj Modi, captains of industry and retailers' representatives, Minister Nyoni said Government will support all the affected businesses and ensure that they are back in business. "As the Government we're in solidarity with all those who lost their businesses and jobs. We're also sorry about those who lost their lives. We're in solidarity with their families. "I'm impressed to see a fighting spirit in the people of Bulawayo, despite what happened and I'm proud of them. Let's continue with the spirit of positive thinking, which makes us the winners at the end of the day. Those with negative thoughts are cowards and they never win," said Minister Nyoni. She said she had not come to Bulawayo with solutions but wanted to listen to the retailers. "I was on leave but I had to break my leave to meet with the retailers so that I'm informed. I'll call another meeting and report back on what I've been told. "As Government we're totally with you and we know that the economy is driven by Government and businesses. I have taken note of what has come from the affected retailers and their leaders," said Minister Nyoni. She said it was also important to find out who was behind the attacks and why businesses were targeted so that they know how to defend their businesses in future. Deputy Minister Modi called for unity of purpose as it will assist businesses to be back on their feet soon. "What happened wasn't good and we never expected this kind of violence. I've been touring the affected businesses and I was disappointed by what I saw. Most business people were left with nothing. They literally have to start all over again. "While Government is committed to assist the businesses, I want to emphasise the need for support from the community. It's important because in some areas residents stopped the demonstrators from vandalising and looting shops and this is the spirit we want," said Deputy Minister Modi. He said his Ministry was compiling a comprehensive report on how much businesses lost to see how best they can be assisted. The retailers urged Government to guarantee security, set up a distressed fund for affected retailers and also avail foreign currency for restocking. 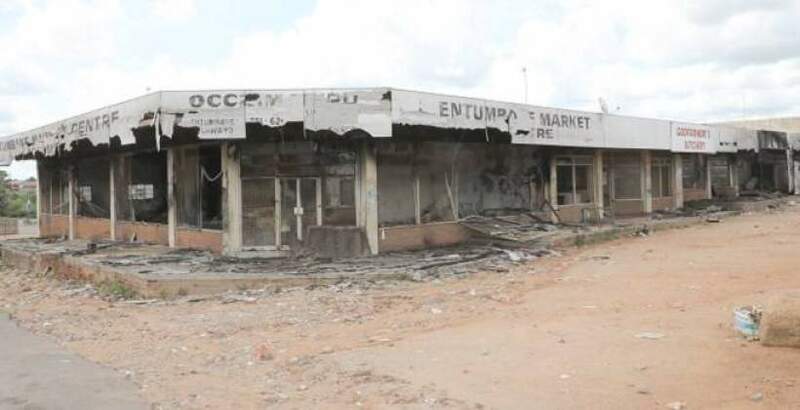 Meanwhile, church leaders and Joint Operations Command (JOC) members in Bulawayo yesterday toured various shopping centres looted and burnt down by violent protesters in the western suburbs to assess the situation. Bishop Sindah Ngulube, the chairperson of the Bulawayo Church Leaders Forum, led the delegation to the affected sites. He condemned violence and urged people to unite and put the interests of the country first. "As church leaders in Bulawayo we strongly condemn violence, which rocked Bulawayo and other cities. "We, however, pray for Zimbabweans to unite and put the nation first. As church leaders working in conjunction with the security sector we have formed peace committees which will help in educating our people on the need to embrace each other and live in harmony as brothers and sisters," he said. Bishop Ngulube said church leaders were planning to conduct workshops and seminars aimed at promoting peace. "As church leaders we are working with the police and we want to come up with ways of assisting our communities to protect businesses that service them," he said.